1. Preheat the oven to 200°C, gas mark 6. Cut the figs in half and place them, cut-side up, on a baking tray. Drizzle over the orange juice and honey. 2. 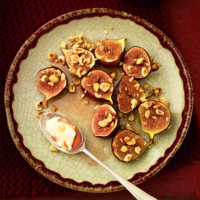 Scatter with the hazelnuts and roast for 6-8 minutes until the figs have softened and the nuts are golden. 3. Serve the warm figs with the roasting juices, saving 1 tbsp to stir into the halt fat crème fraîche.